A toy and treat in one? 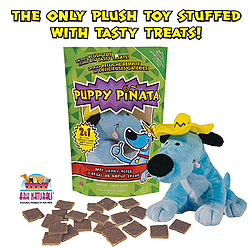 With Puppy Piñata, it’s possible for your pet to enjoy a tasty treat while he plays. This all natural beef jerky treat will have your pup jumping for joy—literally! This great new toy also contains a squeaker for more fun!! Also available in Pink with Salmon Treats.